Clinton-Massie honorary captains Zachary McCracken and Isaac Jaramillo along with Clinton-Massie football players Daulton Wolfe (10), Tyler Lamb (20) and Griffin Laake (87). East Clinton honorary captains Tate Thompson and Anthony Allbright along with East Clinton football players Robert Norman, AUstin Rolfe, Austin Arellano and Daulton Wilson. Wilmington honorary captains Andrew Flanigan and Braydyn Carr along with Wilmington football players Alex Flanigan (75), Justus Farris (77), TJ Rockhold (7), Austin Brummett (52), Willie Morris (3) and Mason McIntosh (9). 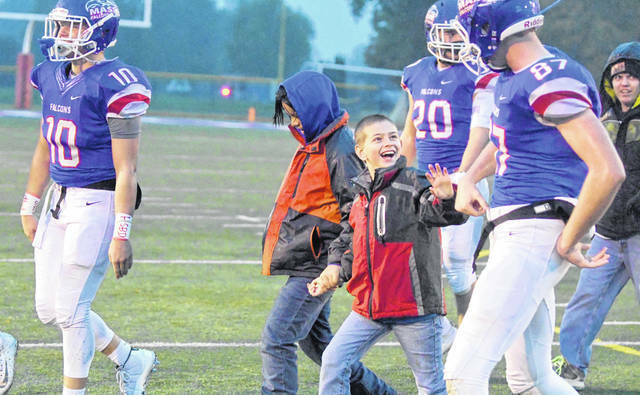 Little Hearts, Big Smiles took part in pre-game coin flips at two Clinton County football games last Friday night. Honorary captains were involved in the Wilmington at Clinton-Massie game as well as the Blanchester at East Clinton game. Little Hearts, Big Smiles was created in 2006 as a supportive outlet for families raising children with special and unique needs. The organization helps create awareness as well as provides opportunities for support and activities for these families. One of the current focuses of the organization is to create accessible and safe spaces in this area. At East Clinton, Blanchester’s honorary captain was M.J. Miller, a first grader at Putman Elementary School. Miller enjoys playing on a trampoline and building with blocks. 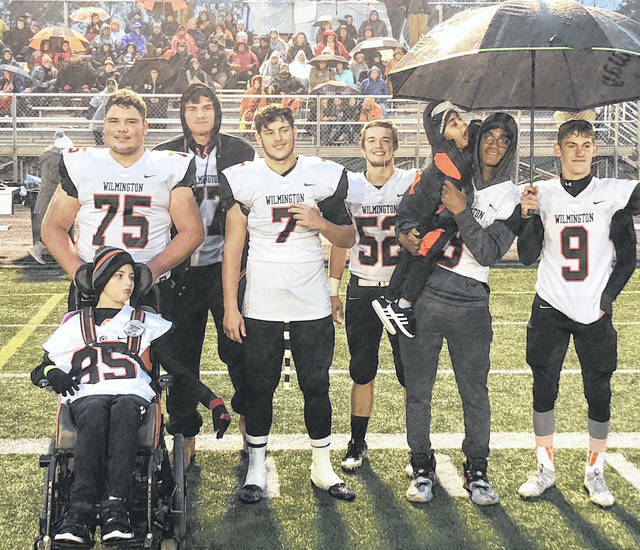 East Clinton’s honorary captains were Anthony Allbright, a freshman at East Clinton High School; and Tate Thompson, a seventh grader at East Clinton Middle School. Allbright enjoys Pokeman and Yu-Gi-Oh. Math is his favorite subject in school. Thompson listens to music and enjoys playing video games, reading and watching videos on a computer. He likes math. Blanchester and East Clinton raised approximately $2,000 for the Fife Avenue playground area. 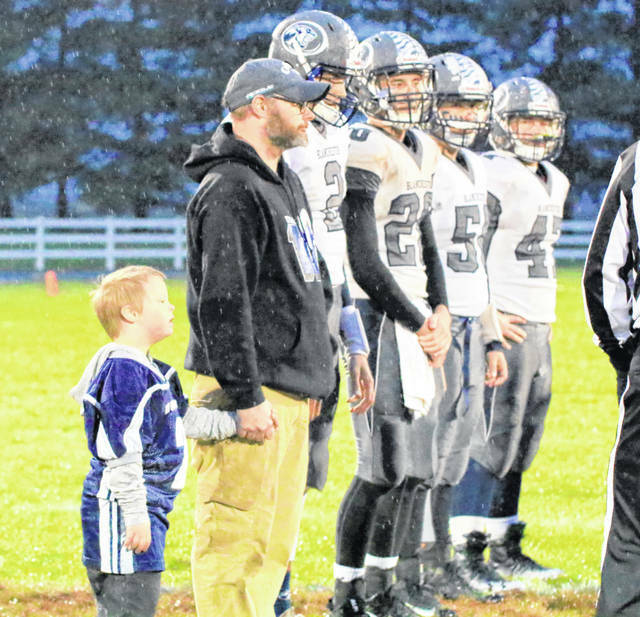 At Clinton-Massie, Wilmington’s honorary captains were Braydyn Carr, a preschooler at East End Elementary School; and Andrew Flanigan, a fifth grader at Rodger O. Borror Middle School. Carr enjoys bubbles, playing on the computer, singing songs and reading stories. Flanigan enjoys boating, attending football games, vacation and watching bowling videos. Clinton-Massie’s honorary captains were Isaac Jaramillo, a fourth grader at Clinton-Massie Elementary School; and Zachary McCracken, a senior at Clinton-Massie High School. McCracken enjoys playing football and bowling as well as playing basketball. Math is his favorite subject in school. Jaramillo enjoys playing ball, especially basketball, playing outside, riding his four-wheeler and riding in his dad’s old truck. https://www.wnewsj.com/wp-content/uploads/sites/22/2018/11/web1_FB10_cm_captainsEC.jpgClinton-Massie honorary captains Zachary McCracken and Isaac Jaramillo along with Clinton-Massie football players Daulton Wolfe (10), Tyler Lamb (20) and Griffin Laake (87). https://www.wnewsj.com/wp-content/uploads/sites/22/2018/11/web1_FB10_ec_captainsSC.jpgEast Clinton honorary captains Tate Thompson and Anthony Allbright along with East Clinton football players Robert Norman, AUstin Rolfe, Austin Arellano and Daulton Wilson. https://www.wnewsj.com/wp-content/uploads/sites/22/2018/11/web1_FB10_wilm_captainsCO.jpgWilmington honorary captains Andrew Flanigan and Braydyn Carr along with Wilmington football players Alex Flanigan (75), Justus Farris (77), TJ Rockhold (7), Austin Brummett (52), Willie Morris (3) and Mason McIntosh (9).